Creative process always finds a way, often many ways, of expressing itself. This story will be familiar to many an artist. In college, young Charles Maher was trying to find out how to reconcile his creative urges with the necessity of making a living, struggling with the split with his own interest-the starving artist thing-and the fact that his father had sent him to the University of Notre Dame with the notion that his son was being prepared for a career in business. Fortunately for Charlie, and for us, he found a mentor who recognized the symptoms of a stifled artist and steered the young man into the fine arts program, with an industrial design concentration. Industrial design couldn’t contain all of Charlie’s creativity, either, but it put bread on the table and preserved his sanity and probably kept him from trying to make a living playing pool (he plays well-beware all ye visitors to his family den). Rock music, camping, kayaking and cars helped, too. Charlie learned to drive at age 14, at the wheel of a ’55 Chevy Bel Aire and then a 1960 Chrysler, but it wasn’t until he went to races with a friend that the car bug really bit. Sports cars and racing predominate his paintings today, though he can turn out a mean Duesenberg or Packard for a concours poster (he’s been commissioned for posters for the Cincinnati and Dayton, Ohio concours, the Gilmore/Classic Car Club of America museum, as well as several for the Woodward Avenue Dream Cruise). Early in his career, Maher worked with a group of passionate young designers at Ford Motor Company, where he hired on in that revolutionary year of 1968, and the connections he made in that brief stint (the economic downturn of the mid-70’s put the low-seniority folks out of work) have lasted ever since. After the layoff, he worked 14 years with a graphics firm in Detroit that did a lot of automotive work, designing production car graphics for Ford, GM, Honda (motorcycles), Toyota and other incidental projects, such as pace car graphics for the Long Beach Grand Prix. He also was a contributor to the Bricklin program, and his design years saw him collaborate with Larry Shinoda, Harry Bradley and others. Throughout, he was painting for himself and taking advantage of opportunities to visit galleries in New York, Chicago, Brussels, Amsterdam, London, Venice and Florence. He draws inspiration from other artists, including his peers in the AFAS and the masters-Rembrant, Vermeer, Van Gogh, Titian, Sargent and Monet are among his favorites. The walls of his home show the results-the subjects are portraiture, rock musicians in concert, landscapes and pets (his family shares its home with a pair of golden retrievers and one loud black cat). That home is also liberally scattered with the results of Maher’s woodworking prowess, yet another creative expression. It was only 11 years ago, though, that Charles set out on his own as an independent artist, designer and illustrator. 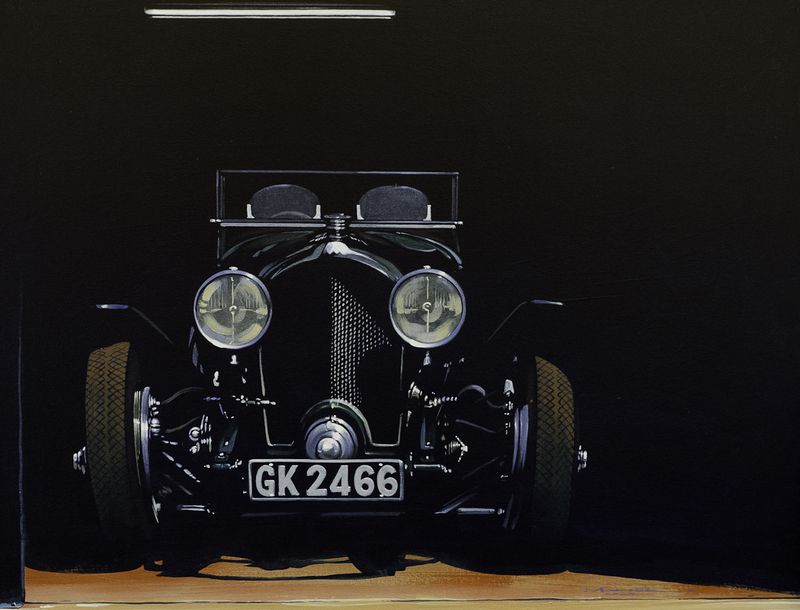 He picked up the paintbrush with serious intent to exhibit his automotive artwork in 1988, and he hasn’t spent any significant amount of time without painting ever since. 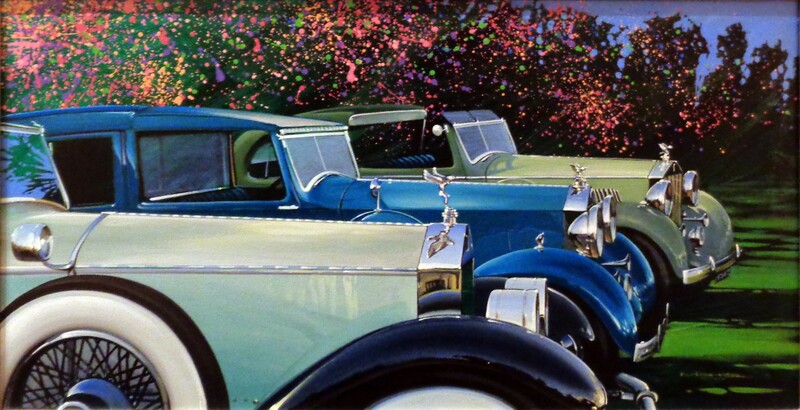 He is a past president of the National Automotive Artists Association, and currently a committee member for the Meadow Brook Historic Races. 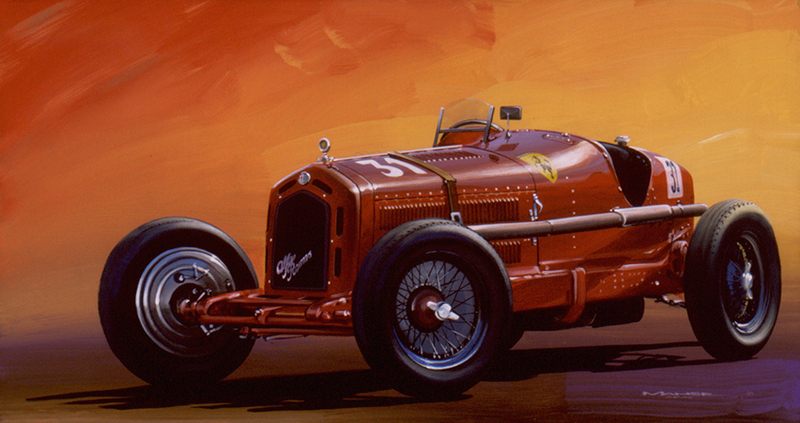 When the Automotive Fine Art Society began receiving new members, Charlie was one of the first invited to exhibit. 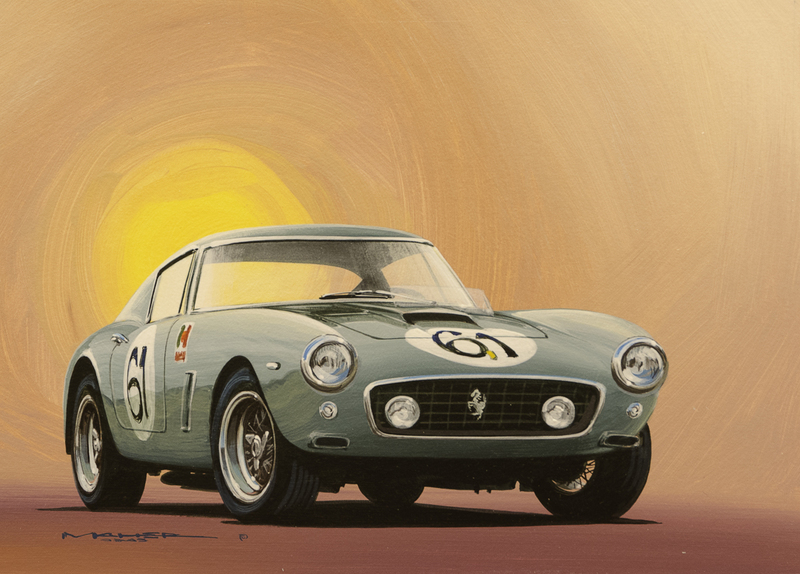 He has done cover paintings for AutoWeek, and Sports Car Market, and his work has also appeared in Racer, Road & Track, Mustang Monthly, Automobile, and Car Collector magazines. 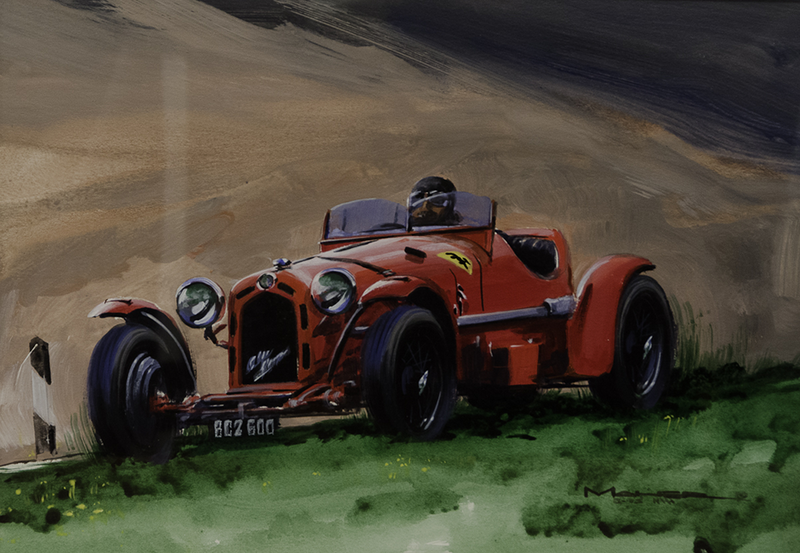 Research takes him to six or seven professional races and another two or three vintage racing events (besides the one’s he’s exhibiting at) every year. In his mid-50’s, Maher says he is still “learning how to paint; I mean how to apply the paint to the canvas.” Charlie works almost exclusively in acrylics, but varies his technique not only from painting to painting, but even within a single work, which might have a watercolor-like background and a very realistic, oil-like subject vehicle. He’ll lay the paint on with a palette knife or squeeze it straight onto the canvas from the tube, like toothpaste, or stand back and splatter a trail of color. His continual experimentation with the medium sometimes leads to the sense that there are several different styles found in his booth at a single exhibit, but over the past few years of watching Charlie’s work evolve I’ve seen a “Maher” signature style, making it easier to spot his work in a crowd. 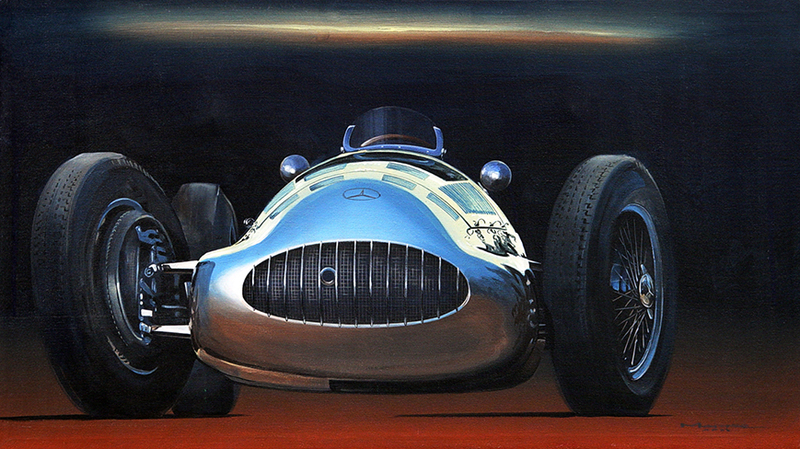 It has much to do with color choices and, in his motorsports work especially, a playfulness with the sense of motion, light, reflectivity, shape and drama. The emphasis on color and drama is evident in a glowing quality to the light in his work that may be inspired by his growing-up years in Miami, Florida or his cultural influences as a young adult of the psychedelic ’60s (remember those bright orange and lime-green cars? ), but which he also attributes to being partially colorblind. Next to the easel in the studio he’s built in his Bloomfield Hills home, there’s a board on the wall with stripes of acrylic paint, each one labeled by color name and number, “that keeps me from embarrassing myself too often,” Charlie says. With maturity Charlie has set aside his riskier former interests–skydiving and mountain climbing–but of late his creativity has been expressing itself in yet another way. He’s combined his woodworking, graphic and musical passions to become an amateur luthier, crafting beautiful solid-body electric guitars from exotic woods. It began as something to do with and for his son (he also has a daughter, son-in-law and granddaughter) and has built a guitar for a professional musician in Minneapolis. He also has built one for himself and hopes to learn how to play it someday. Creative passion just will not lie down and be quiet. Isn’t that wonderful?